Agnes Sorel (1422-1450). La Dame de beauté. Home » Agnes Sorel (1422-1450). La Dame de beauté. Agnes Sorel (1422-1450). Dame de beauté. Medieval, gothic, burgundy fashion era. Agnès Sorel. Dame de beauté. 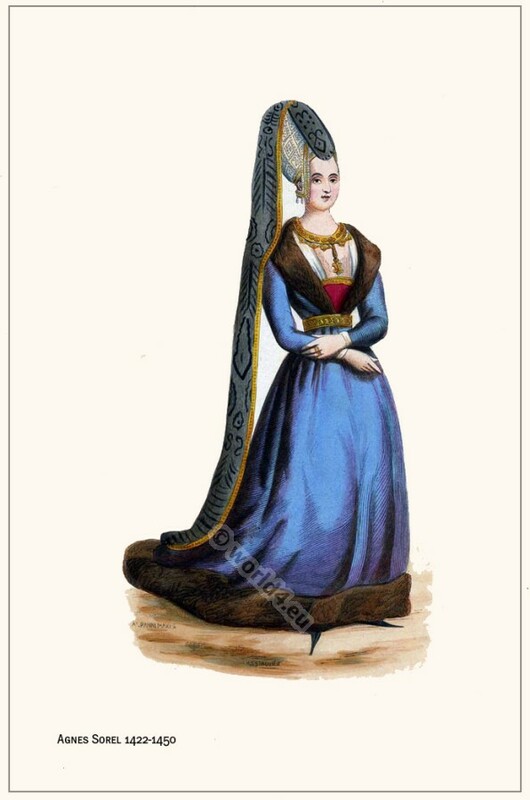 AGNES SOREL or Soreau, known by the sobriquet Dame de beauté, 1422 – 1450), mistress of Charles VII, King of France (1403 – 1461), was born in the village of Fromenteau, in Touraine. 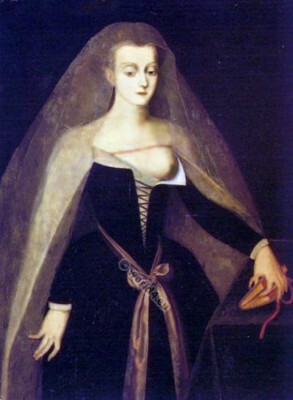 She was the daughter of the Seigneur Jean Soreau, a nobleman of low nobility attached to the house of the Count de Clermont, and Catherine de Maignelais. She was first maid of honor of Isabella, Duchess of Lorraine and wife of King René of Naples. In contemporary sources Agnès Sorel is described as exceptionally beautiful and extremely intelligent young woman. With the advantages of an elaborate education added to her natural gifts, she came, as maid of honor to the Duchess Marie d’Anjou, during the Hundred Years War to the court of France in the year 1431. Agnes, who was called the Maid of Fromenteau, was then in the full bloom of her beauty, and easily captivated the heart of the King. 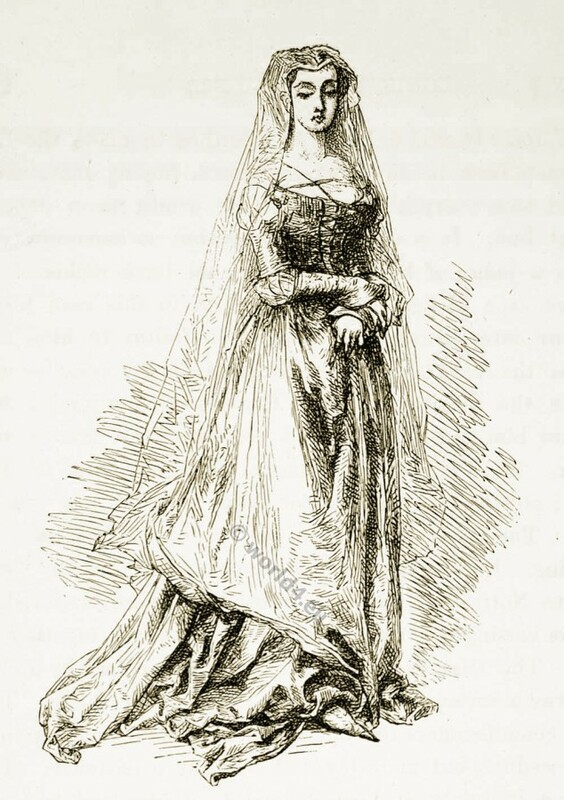 In order to attach her to his court, he conferred upon her the position of maid of honor to the Queen Marie d’Anjou. At this period Agnes Sorel was considered to be the most beautiful woman of her day. Her conversation and wit were equal to her beauty. In the Histoire des Favorites (part i. p. 103) she is said to have been noble minded full of generosity with sweetness of manners and sincerity of heart. The same writer adds that everybody fell in love with her from the king to the humblest officers. Charles VII became passionately attached to her and in order to insure her constant presence at court he placed her as maid of honor to the queen. She was the first official mistress of a French king. The amour was conducted with secrecy but the fact became manifest by the favors which the king lavished upon the relations of Agnes while she herself lived in great magnificence amidst a very poor court. She was fond of splendor and has been quaintly described by Monstrelet as “having enjoyed all the pleasures of life in wearing rich clothes furred robes and golden chains of precious stones and whatever else she desired.” When she visited Paris in attendance upon the queen the splendor and expense of Agnes were so excessive that the people murmured greatly whereupon the proud beauty exclaimed against the Parisians as churls. The English were then masters of half the kingdom of France. Charles, though naturally brave, had fallen into a profound apathy in consequence of a feebleness of character which unfitted him for the struggle against misfortune. Agnes alone succeeded in recalling him to a sense of what was due to his own glory and that of his people. Shortly after the birth of her fourth child Agnès Sorel became seriously ill. Her contemporaries called this disease as “flux de ventre”. She died on 9th or 11th February 1450 at six o’ clock in the afternoon. “How disgusting, smelly and prone we’re” have been her last words. The heart and intestines of Agnes were buried at Jumièges. Her body was placed in the centre of the choir of the collegiate church of the Château de Loches which she had greatly enriched. Her tomb was in existence at Loches in 1792. It was of black marble. The figure of Agnes was in white marble; her head resting upon a lozenge supported by angels and two lambs were at her feet. Agnès Sorel led as influential maid at the French royal court and mistress of King Charles VII. of France the fashion of the uncovered breast. Read more: Fashion under the Reigns of Charles VI. and Charles VII. 1380 to 1461. 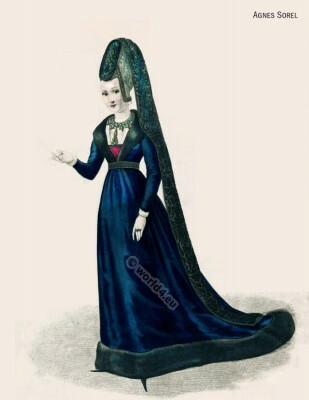 This entry was posted in 1450, 15th Century, Burgundian dress, Court dress, France, Middle Ages, Nobility and tagged Burgundian fashion period, Gothic costumes, Medieval costume on 5/28/13 by world4.